When working on a production, efficiency is key and Harmony is all about helping you stay focused. Through a set of new powerful tools, Harmony 16 supports pipeline integration and helps you be more efficient, increase your productivity, and solidify your workflow process. 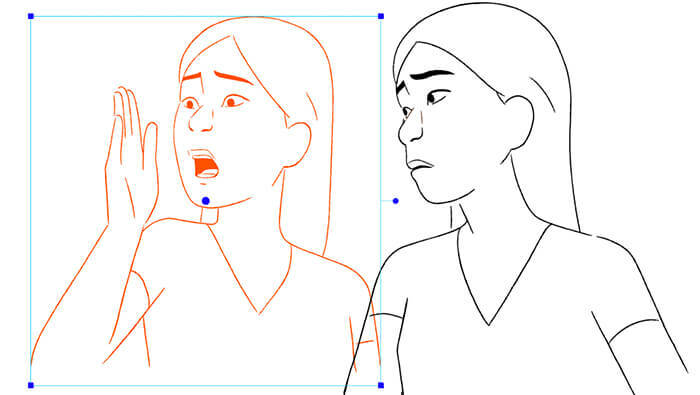 For finer control over your animation and to stay on model, activate Advanced Onion Skin, and then select which drawings you wish to see before and after. You have the freedom to choose which drawings or frames you see, skipping over the ones that aren't essential. Quickly view all available substitutions and easily make your selection. Zoom in/out to view larger or smaller thumbnails. Pop out the window and resize it to display more thumbnails. 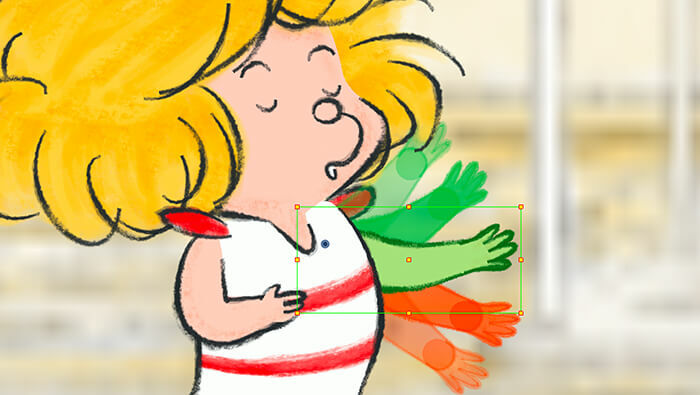 The need to adjust the position of a prop or character over multiple frames is often required. To speed up these changes, two innovative tools have been added to Harmony. Expedite the task of manually editing a prop, character or pose over multiple frames with this new tool. Select your element, define the frames via the Onion Skin and make your modifications. It's as simple as that! Swiftly make changes with this new flexible feature. 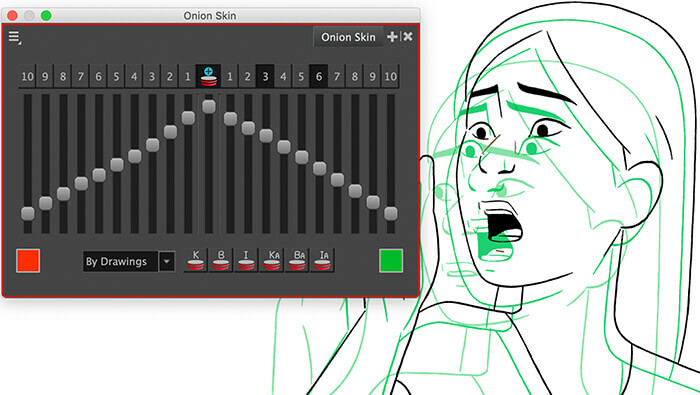 Use the Onion Skin to select your drawing or simply a portion of what you want to change. 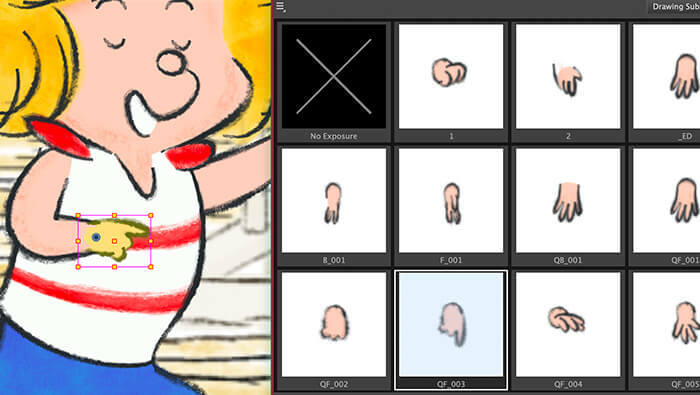 Apply your changes with the Paint and Select tools which will quickly modify your selection across multiple frames. In a single move, you can effortlessly select multiple points on a Curve or Envelope deformer to modify its shape then nudge your points for precise positioning. It's now easier than ever to build node graphs that are organized, simple to navigate and will help streamline workflow. Snap cables into straight lines and align nodes with one another for better organization. 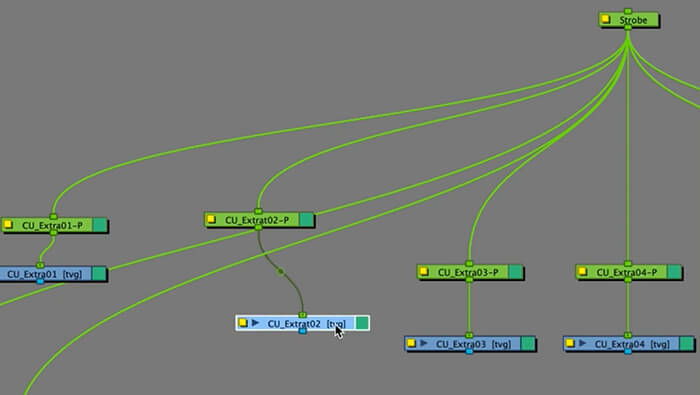 Select multiple nodes and connect them to an existing or new Composite. Nudge nodes using keyboard arrows to precisely position them. For ultimate cable management, use the new waypoints to connect your nodes together. Quickly navigate through the node graph using keyboard arrows. For improved usability, enhancements have been made to Master Controllers making it easier for riggers and artists to adopt this powerful tool. Harmony 16 now comes with pre-packaged Master Controller Setup Wizards, giving you the control to create Master Controllers -- no scripting required. To promptly set up an interpolation grid and sliders, quickly access setup wizards via a new toolbar. Animators can quickly find their Master Controllers via the new Master Controller view. Select and activate controllers to instantly display them in your Camera view. Now anyone can access this robust tool thanks to its user-friendly interface. To keep you on track and help you stay productive, Harmony 16 is equipped with key performance enhancers. Harmony 16 significantly reduces latency by allowing you to work from a local cache. When opening a file in database mode in Harmony, simply select the option to locally cache your scene. Drawings will then be copied from the server to your workstation, shortening the time it takes to load and save files. Interactive software rendering speeds have been improved. If a prop is modified or an effect is added to a character or a scene, Harmony 16 will merely render the item changed and not the entire scene, significantly cutting down render times. Harmony 16 also has faster rendering speeds for 4K scenes. With Harmony 16, new features have been added that inspire creativity and facilitate compositing tasks. Simulate a natural looking camera shake with the new Shake Node in Harmony 16. 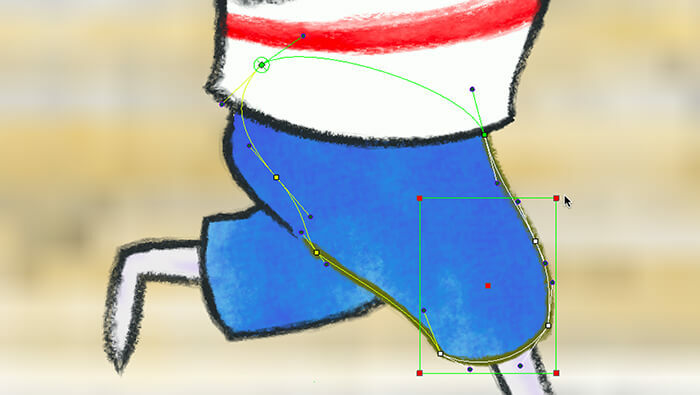 Obtain smoother movements between shake positions, conveying a continuous realistic effect. 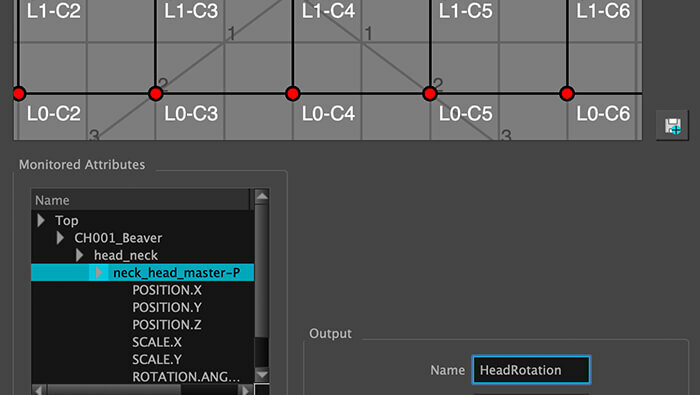 Transform your background into an infinite looping pan with the new Transform Loop node. In a few quick and easy steps, you can instantly loop an animation cycle on a background, giving the impression of a pan. You can also infinitely tile your background vertically or horizontally to create even longer pans, helping you avoid the need to copy and paste keyframes. You can now import, rotate and scale a 3D model and then convert to a 2D image directly in Harmony 16. Reposition your 3D model and convert to 2D as many times as you want, for better workflow and better 2D-3D integration. Eliminate the need to depend on third-party 3D software to render 3D models into 2D for use in Harmony. Convert 3D sets or props to 2D to use in the scene or as a drawing reference. Render 3D models to 2D for faster interactive and playback performance. Instantly transform your scene into an animated GIF with Harmony 16's new export feature. Don't forget to share your GIF for a chance to go viral! Choose the Harmony edition that meets your needs. Have a question about Harmony?